Fates of Frankenstein: Call for Papers! Mary Shelley (2017) begins with the sound of writing. This is an interesting choice, in that it initially establishes a very particular the tone for this biopic as one that is about writing and work rather than (just) who slept with whom. As the director of the break-out hit Wadjda (2012), and Saudi Arabia’s first recognised female filmmaker, it’s no surprise that Haifa Al Mansour’s vision shows us a brilliant, rebellious girl who writes Frankenstein while she is still a teenager. The focus on Mary as writer and on the genesis of Frankenstein make this into a biopic worth seeing. It offers us some of the pleasures associated with costume drama (frocks and strong boho hair inspiration for festival/wedding season) and successfully combines this with a feminist take on the biopic, in the spirit of Patricia Rozema’s underrated and revisionist Mansfield Park (1999) which brings biographical elements of Jane Austen’s life to refashion Fanny Price (otherwise known as the protagonist no one can like, according to Lionel Trilling). 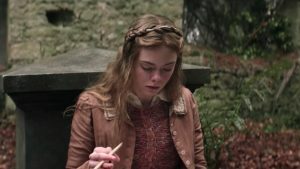 Just as Rozema’s film is invested in offering up a complex female protagonist who is a reader and writer, but who also wants to experience pleasure and connection, so too is the Mary Shelley we meet here, fashioned by its director alongside writer Emma Jensen, and actor Elle Fanning. 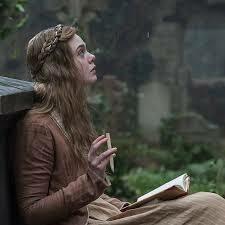 Throughout the film’s early scenes, we see Mary scribbling furiously in a notebook and reading gothic novels on her mother’s grave in St. Pancras’s Churchyard. Mary is a wilful, sharp girl suffering under the domestic responsibilities she is still expected to undertake even in a household headed by her radical father William Godwin(played here with gravitas by Stephen Dillane). 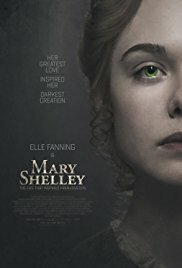 When Percy Bysshe Shelley enters the narrative, the film works hard to render the attraction between Percy and Mary as entirely mutual, and their scenes of flirtation display an equality of desire that is often missing from the screen, let alone from stories with young women protagonists. In this sense, the film recalls work such as Mira Nair’s Vanity Fair (2004), and even Jane Campion’s The Piano (1993). Like those other desiring protagonists before her, Mary is not coy, but instead fully in charge of her desire for Percy (played here by the absurdly pretty Douglas Booth). For me, the score is irritatingly ROMANTIC in these sequences, as if everyone’s inner goth princess weren’t entirely swept away by the secret notes and stolen embraces. Once Mary and Percy really defy society and run away together, along with Mary’s half-sister Claire, a decadent freedom takes hold, and there’s a lot of wine and lolling around for the ladies, up until Mary becomes pregnant. During this time they move from their realistically grotty digs to an upscale location in Bloomsbury, as Percy manages to temporarily sort out his finances (see: evade his creditors). In terms of intrigue, there is plenty. The film openly documents Percy’s liaison with Claire throughout Mary’s first pregnancy, and in this sense the film is clearly a well-researched one, with a clear sense of wanting to offer the audience a sense of Mary’s reality. The affair between Percy and Claire is discussed at length by Fiona Sampson in her 2018 biography In Search of Mary Shelley: The Girl Who Wrote Frankenstein: “Claire is much more the typical poet’s girlfriend. She’s no writerly rival but a nice little singer; her dark curls are obviously pretty, and she has no interests (or indeed pregnancy) of her own to get in the way of her continual availability.” (108) This is an apt description for Claire as played here with great vivacity by Bel Powley, who later takes up with Lord Byron. Perhaps the film’s most enjoyable performance aside from Fanning’s Mary is the one delivered by Tom Sturridge as Byron. Sturridge’s Byron looks as if he is having the time of his life slinking around in eye-liner and a series of elaborate evening coats. This Byron is fittingly outrageous and openly queer, a complete peacock raking his lashes over every attractive person he sees, and its rather thrilling when he kisses Percy outside the Villa Diodati. The scenes that then take place at Villa Diodati are rich in imagery, including a prolonged examination of Henry Fuseli’s painting The Nightmare (1781), significant for its association with key gothic themes, in addition to the fact that Fuseli was Mary Wollstonecraft’s first lover. Al Mansoor’s film takes the liberty of hanging this painting in the sitting room at Villa Diodati, and this is one of the intriguing ways the film adapts its material. The painting provides one of several moments of visual condensation and adaptation by evoking Mary Shelley’s heritage as well as Frankenstein’s screen afterlives in films such as Ken Russell’s Gothic (1986). Mary Shelley also devotes an extended sequence to the infamous dream of the student of anatomy that inspires Mary to begin writing Frankenstein. Here, we are shown Mary experiencing a waking dream in her bedroom at Villa Diodati. She awakens to a scene of a galvanist presiding over a shrouded body where a forearm covered in black stitches flexes in response to the electrical current. The sequence masterfully conveys Shelley’s own shaping of this anecdote as part of her novel’s mythos. In turn, this is another key moment of condensation, evoking Frankenstein’s most famous dramatic screen adaptations: James Whale’s Frankenstein films, and John Logan’s Penny Dreadful television series. It’s here that the film is at its strongest, offering us an understanding of the genesis of Mary Shelley’s most famous work. The film’s final act deals with Mary’s struggle for recognition as the author of Frankenstein, and this third act is part of what makes the film particularly resonant for younger audiences, as she is dismissed due her youth and her gender. With these themes, it’s no surprise that Edinburgh International Film Festival’s Young Programmers made Mary Shelley part of their official selection this year. This a fitting film for Frankenstein’s 200th year, and offers up a pleasurable and well-made version of Shelley’s life. The Writer At Work. More images like this of women writers please.